We have funded over 175 community groups in the communities we serve, through our grants and sponsorship programs. Over 175 community clubs and organisations have benefited from this funding since our bank opened its doors in 1999. 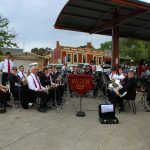 Arts, music and film festivals, community buses, respite homes, new playgrounds, driver training for L-plate drivers, as well as solar panels and water tanks are just some the projects funded by the Maldon & District Community Bank® Branch. More than $100,000 has gone to local emergency services to purchase new fire engines, forward command vehicles, upgrades to their facilities, defibrillators and training their volunteers. Local sporting clubs benefit from the bank’s presence, receiving funding so they can stage tournaments, kit out players in new uniforms and upgrade ageing facilities. The region’s preschools, primary and secondary schools receive much needed funding for innovative programs and resources. 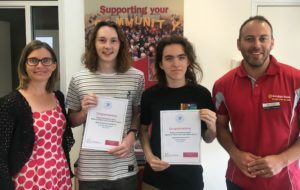 Two local tertiary students have received a helping hand thanks to scholarships from the Maldon & District Community Bank®. Ty Elliott-Thompson from Dunolly and Maldon’s Cedar Blazely were presented with the scholarships at a special presentation at the Maldon Bank Branch. The scholarships provide support for local students undertaking university or TAFE studies. The recipients are selected on the basis of personal qualities, challenges to study and need. The Maldon & District Community Bank® is delighted to assist young community members with their tertiary studies. The annual scholarship program was launched in 2018. This year the Community Bank added an additional scholarship in response to the demand for support. Ty Elliott-Thompson was awarded the major scholarship of $2,000. Ty has followed his passion for acting and is currently in his second-year studying Acting for Stage and Screen at Ballarat’s Federation University Arts Academy. The $1,000 scholarship was awarded to Maldon’s Cedar Blazely. The funding will assist Cedar with the costs of living away in Melbourne for his Certificate 3 Science course at RMIT. “Ty and Cedar are very worthy recipients of the scholarships. They were chosen from an outstanding field of applicants – it was a tough decision but these two definitely stood out. The scholarships will help them overcome some of the obstacles of studying away from home,” said Maldon & District Community Bank® Chairman Ross Egleton. One of our largest single sponsorship to date was for the Mount Alexander Support and Respite Group (MASARG). Mount Alexander Shire is the only local government area in Victoria not to have a respite house for ageing parents with disabled children. The Bank was approached by parents to support the building of a respite and multi-function centre. The Bank offers monetary support, marketing and business advice to this small and extremely dedicated group. 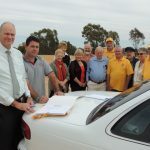 This is a real partnership between Castlemaine Lions Club, State Government, Mount Alexander Council, hospitals and local agency Windarring. Maldon Brass Band is sounding better than ever with the acquisition of new instruments. Two cornets were added to their collection, thanks to $2,237 from the Maldon & District Community Bank®. Daniel Clarke, Maldon Brass Band’s Director of Music, welcomed the funding for the new instruments. Football / netball clubs are at the heart of most country towns, and ours are no exception. 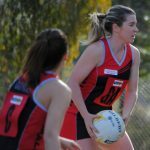 Our four local clubs – Dunolly, Maldon, Newstead and Castlemaine – have benefitted from having the Maldon & District Community Bank as a major sponsor for 5 years running. Branch Manager Adam Balzan said the bank recognises the key role sporting clubs play in the health and social fabric of small rural communities. Over 400 safer and more confident drivers on our roads… that’s worth celebrating. And that’s just what happened in October when the milestone of 400 graduates of Maldon & District Community Bank® Branch learner driver program was reached. Amongst the most recent graduates was Maddison Vearing from Harcourt. She is the fourth member of the Vearing family to complete the course, with her older siblings Bryn, Joel and Adam taking part in previous years. The Maldon Bank has contributed over $350,000 to run the hands-on intensive driver training program since 2003. This funds learner drivers to participate in a tailored 5-day program. The participants drive in a group of three, with a qualified instructor, in a range of different environments and traffic conditions, including un-sealed country roads, highway and city driving, and defensive driving. “We are so incredibly proud of reaching the feat of 400 graduates. We established this program in 2003 after a series of accidents and near misses involving young drivers in our region,” said Branch Manager Adam Balzan. Contact the Maldon Branch on 5475 1747 or maldonmailbox@bendigoadelaide.com.au to find out more about the program or to register your interest. There is a charge of $150 per participant, and graduates receive a reward of a $50 bank with the Maldon & District Community Bank® when they complete the course.